SSFIIT is a fighting game. 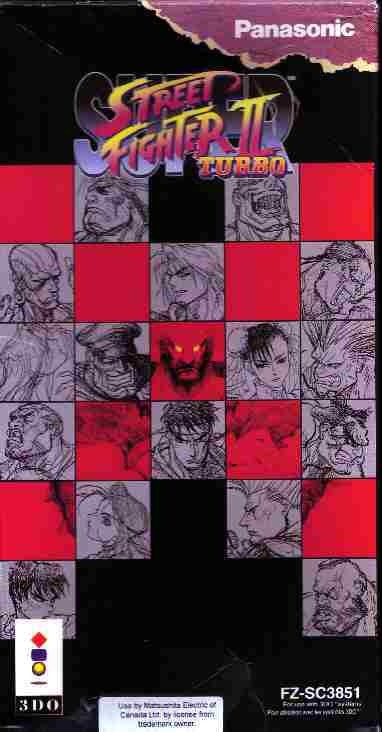 Not any ordinary fighting game but a great one at that. Countless hours of play make this a real gem, and also one of my favorite games. I wish they made a few other street fighters for 3DO but I guess not. Graphics are terrific. Characters and moves are highly detailed. Fireballs and things like this never looked better. Also the backgrounds look awesome. These graphics are near arcade perfect. No slow down even when there is a lot of commotion on screen is great! Overall alright. Could have been a little better. Background music is wonderful along with some of what the characters sound. But that anouncer feller could have been done much better in my opinion. Someone kick that fella in the balls because ARNOLD could do better. Great control makes a great game! Control is even better with the Capcom fighter stick but is still good with the regualr old controller. Moves are a bit to hard to pull off for some characters take Dhasilm( weird stretchy guy) for instance. Geeze! You need to memorize 11 or so movements. And other characters it's easy to pull moves off, like Balrog for instance. His special is easy and so are his moves I don't get why one is really difficult and weak while the other is easy and powerful. But that is just minor and overall control is great! AWESOME! Its really fun and you could play for hours on end. The versus mode makes it really fun espescially if your good. Sometimes I have to let my opponent win just so they'll stay. It's nice how you can pick the location of where you are going to fight. Super Battle mode is your other option and it is for one player only. You can pick between turbo 1, 2 or 3 but only use 1 seeing that it is way to fast on the other ones and everything is just a blur to me. The only thing is I wish you could just pick Akuma because that code I just cannot pull off please e-mail me hellp on how to do it easily! But that's a side note, overall great! Almost perfect. Only thing is the moves are difficult to pull off for certain characters. If it wasn't for that it would be perfect. My favorite fighter is now reviewed and this time TRIPOD better save it right!